People protest against the murder of Honduran environmental activist Berta Caceres in front of the Honduran embassy in Santiago on March 7. 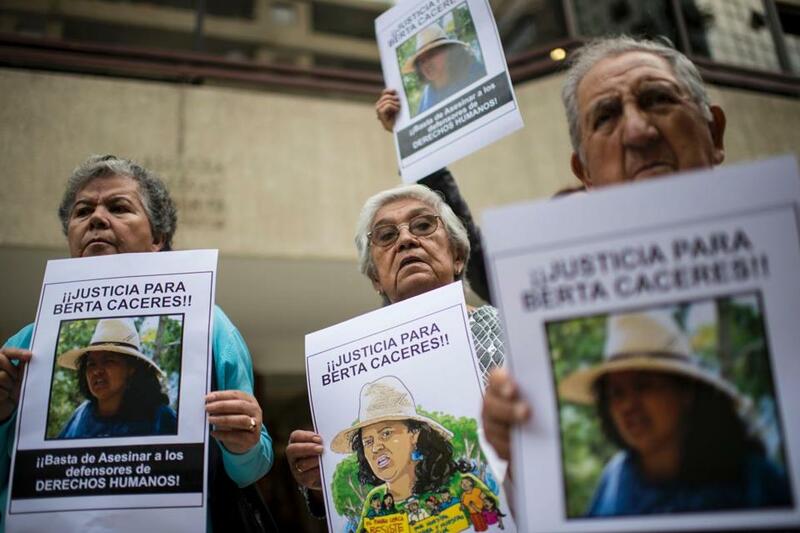 Before dawn one morning early in March, gunmen burst into the home of Berta Caceres, the most outspoken environmentalist in Honduras, and murdered her in her bed. It was a tragedy on many levels, but also something more. This killing brings into sharp focus the horror that has been inflicted on Honduras since an American-approved coup there seven years ago. Because the American who approved that coup was Secretary of State Hillary Clinton, it also shadows — or should shadow — the American presidential campaign. Honduras has, nonetheless, held regular elections. The winner in 2006 was Manuel Zelaya of the Liberal Party, which American leaders have always viewed as unfriendly. Americans deposed a Liberal president in 1911 after he chose to borrow money from European instead of American banks. The next Liberal to take power was deposed in 1963 after proposing a land reform law that would have affected interests of the United Fruit Co. Zelaya suffered the same fate. The legacy of El Salvador’s brutal civil war lies in a shallow grave. Today, some people are starting to dig. Powerful Hondurans were repelled by Zelaya’s advocacy of populist reforms like subsidies for small farmers and increased minimum wages. Some in Washington disliked to him because of his ties to President Hugo Chavez of Venezuela, who was then a hot-button bogeyman. On the night of June 28, 2009, after Zelaya proposed a referendum to change the Honduran constitution, soldiers stormed his residence, captured him, and put him on a plane out of the country — in his pajamas. This coup was a throwback to the bad old days when Central American generals deposed elected civilians at will. Nearly every country in the hemisphere condemned it. A resolution was introduced at the Organization of American States demanding the “immediate, secure, and unconditional” return of President Zelaya. The United States blocked it. Caceres, 43 years old at the time of her death, was a tireless leader of the indigenous Lenca people. For years she had been campaigning to stop construction of a dam in her native region, one of many in Honduras that involve privatizing rivers and uprooting communities. Last year, she won the world’s most prestigious award for environmental activism, the Goldman Prize. “Her murder would not surprise her colleagues,” the citation said.